SAN FRANCISCO - March 14, 2016 - PRLog -- Lorraine Hansberry Theatre (LHT), celebrating 35 years in 2016, relaunches its production of THURGOOD by George Stevens, Jr. April 7-17, 2016 after sold-out audiences last July at the Creativity Theater. A limited run of eight encore performances will be held in the Buriel Clay Theater at the African American Art & Culture Complex, 762 Fulton Street (near Webster) in San Francisco. 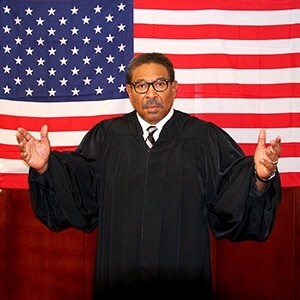 Directed by Margo Hall, LHT's production features its Artistic Director, Steven Anthony Jones, who brings Thurgood Marshall, one of the defining American characters of the 20th Century, back to life in this eye-opening, humorous and personal portrait. THURGOOD is a powerful one-man play first produced on Broadway in April 2008 starring Laurence Fishburne (Black-ish). With the 2016 United States Presidential election race in full motion and a vacancy on the U.S. Supreme Court, LHT's timely production serves as a reminder of how our civil rights were fought for and won through the courage of citizens such as Thurgood Marshall. In the play, set at his Howard University alma mater, a retired Justice Marshall gives a lecture reviewing his life rising from the back alleys of Baltimore to become a champion of Civil Rights and the first African-American Justice to serve on the U.S. Supreme Court (1967-1991), appointed by President Lyndon B. Johnson. As a civil rights lawyer, Thurgood was the architect of many court challenges that became the foundation of the Civil Rights movement. In 1954, he argued and won Brown v. Board of Education in front of the Supreme Court that ultimately led to the end of institutionalized segregation. Thurgood Marshall described his 1944 success in a case striking down all-white primary elections in Texas as his "greatest victory." It took another 20 plus years for the passage of the Voting Rights Act in August 1965 that provided the tools to protect the right of blacks to participate equally in the political process, and then, only after "Bloody Sunday" on March 7, 1965 and marches from Selma to Montgomery, Alabama. With the 50th Anniversary of the Voting Rights Act in August 2015 and California's Primary Elections approaching in June, the Lorraine Hansberry Theatre contends that now is the time to re-educate and re-inspire citizens with a modern day civic lesson through the non-threatening forum of the performing arts. Thirty-minute talkbacks follow matinee performances with thought-provoking discussions between the audience, the artist and community leaders about the impact of desegregation, civil rights then and now, the struggle it took to win equal voting rights, and why it is important to exercise the right to vote. TICKET PRICES: $25 Adults; $20 Seniors (65+) & Students (21 & Under); $15 Children (12 & Under); 10% discount for groups of 10-25. Groups over 25, contact the Box Office. BOX OFFICE: Purchase tickets online at http://LHTSF.org/tickets.html. Phone: (415) 474-8800. Email: BoxOffice@LHTSF.org. Web: http://www.LHTSF.org. On the HomePage, click Buy Tickets Now tab. VENUE: Buriel Clay Theater, African American Art & Culture Complex, 762 Fulton Street (near Webster), San Francisco.